People who have experienced a mental health problem can work on a voluntary basis at the nursery, in a wide variety of roles, for as long as they wish and need. The aim is to provide a happy and relaxed family-like community and to assist people to move forward in all aspects of their lives, while feeling safe, needed, cared for and respected. At their request, the nursery workers are called volunteers. This emphasises the fact that Cherry Tree is an independent charity, and not part of the mental health services. People attend on a voluntary basis, because they choose to do so. Around 150 volunteers are on the nursery books at any one time, coming to us from many sources, including the Dorset & Hampshire NHS Trusts, and the local Employment Service and volunteer bureau. We also accept self referrals. 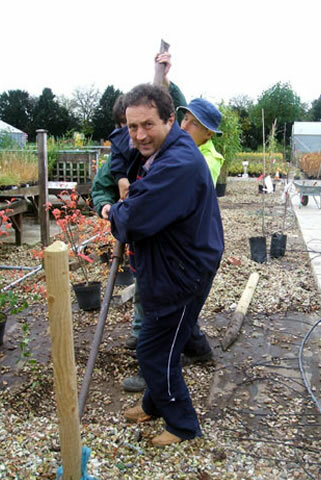 The majority of the volunteers work in the wide variety of horticultural tasks required to ensure the daily running of the nursery. Tasks vary from weeding, potting and taking cuttings, to construction and irrigation work, stocktaking, working in the plant sales area or delivering plants to customers. Others make the tea and coffee and do domestic duties, or work in the office, invoicing, producing plant labels, writing letters, and sending out mail-shots. The work is organised, supervised and allocated by the staff, but some volunteers progress to supervising and teaching others. We are also assisted by a group of Friends of Cherry Tree. This is not a job creation scheme, everybody’s work contributes to keeping the nursery going; everyone’s contribution, large or small, is useful and valued. Volunteers are not paid, there is no competition, it’s OK to have a bad day and rewards come in other ways. The volunteers come from an enormous variety of backgrounds, with many different skills and experiences, but they all share similar difficulties, problems and struggles, which is why they support each other so well. They build up very close friendships by working together in groups. Alone they cannot cope, but together they are strong. The work done by our volunteers becomes meaningful and important to them, building the routine and structure of everyday working life, but in a pressure-free environment. Some people stay for many years, while others move on fairly quickly, some returning to work, others going to college or taking up other voluntary work.